Often referred to as the “Fourth Estate”, the media plays an important role in any democratic society. A free press is essential to hold governments accountable and inform the public, thus enabling voters to partake in political debate and make qualified decisions. The United States also has a long history of a free and independent press, with organisations such as the New York Times, Time or CNN renowned and respected around the world. however, in recent years Americans themselves started losing faith in their country’s media organisations. 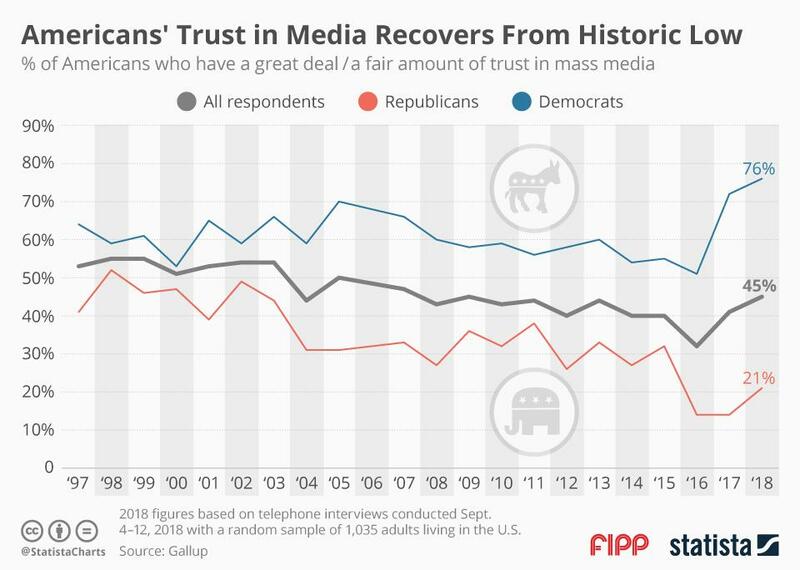 Arguably inspired by a president who makes no secret of his aversion to the press, the percentage of US adults having a great deal or a fair amount of trust and confidence in mass media dropped to a historic low of 30 per cent in 2016. While President Trump recently renewed his denunciation of the media as “the true enemy of the people”, the public view of mass media is gradually improving from its 2016 low point. According to polling company Gallup, 45 per cent of adults in the US expressed their trust in the mass media in a September 2018 survey, marking a significant improvement over the 2016 outcome of the same survey. Gallup reports that the level of trust in the media varies greatly depending on political preference. While Republicans have traditionally viewed the media more critically than Democrats, the divergence between both sides of the political spectrum has never been greater in terms of how the press is regarded – a trend mirroring a political climate that seems more hostile and divided than ever.